With a 3-day weekend approaching I knew I had to get out for a long hike. It was still raining on Saturday from an Alaskan winter storm so that was out of the question, but Sunday was perfect to get outside. Finally! 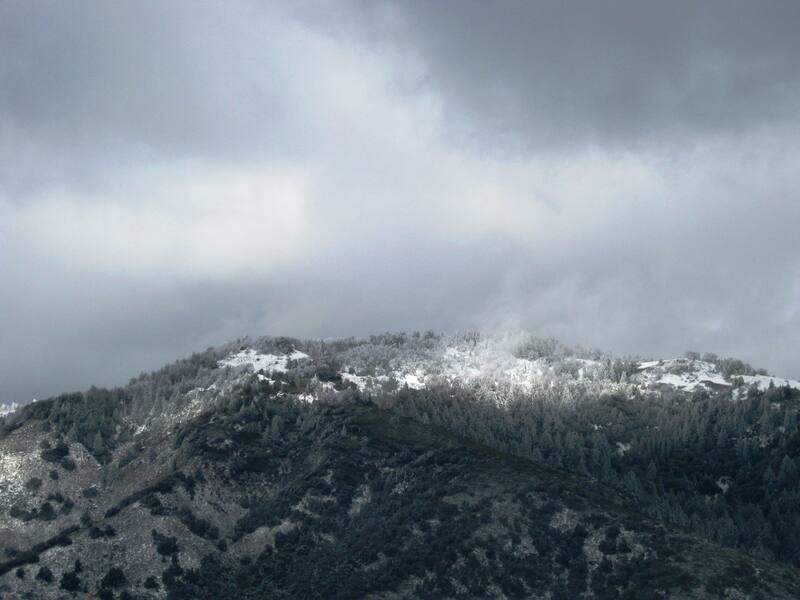 We had heard that the Laguna Mountains got over 5 inches of snow and that the snow level had dropped to 3000 feet. It was decided that to avoid the crowds we should go to Santa Ysabel Open Space Preserve-East, one of our favorite hiking spots. We left San Diego around 9am under sunny/cloudy skies. Around 10:15am we reached the trailhead off Highway 79. Surprisingly we were the only car. A sign at the trailhead said, Preserve Closed Due to Rain, but ever the intrepid hikers we hopped over the gate. 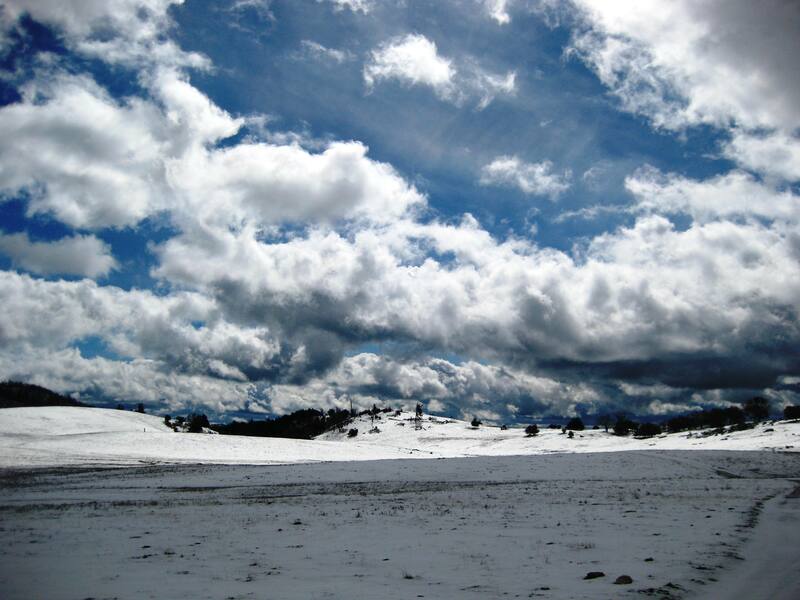 Cows were grazing near the start of the trail as we figured that snow had covered the areas where they usually graze. Yes, the trail was muddy, but not too terrible. 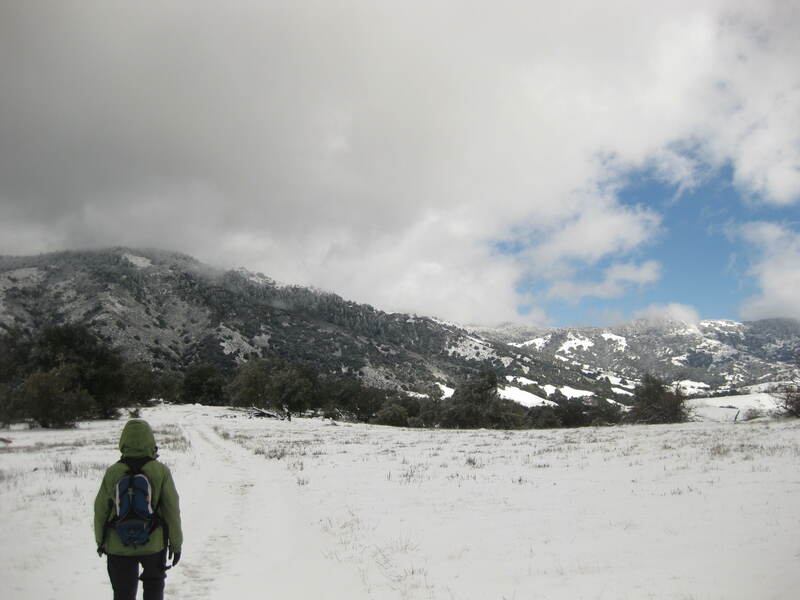 Little did we know that we would be hiking through snow covered fields with views of frosted pine trees. It was beautiful! I’m glad I brought my GPS so that we could keep track of mileage and elevation. 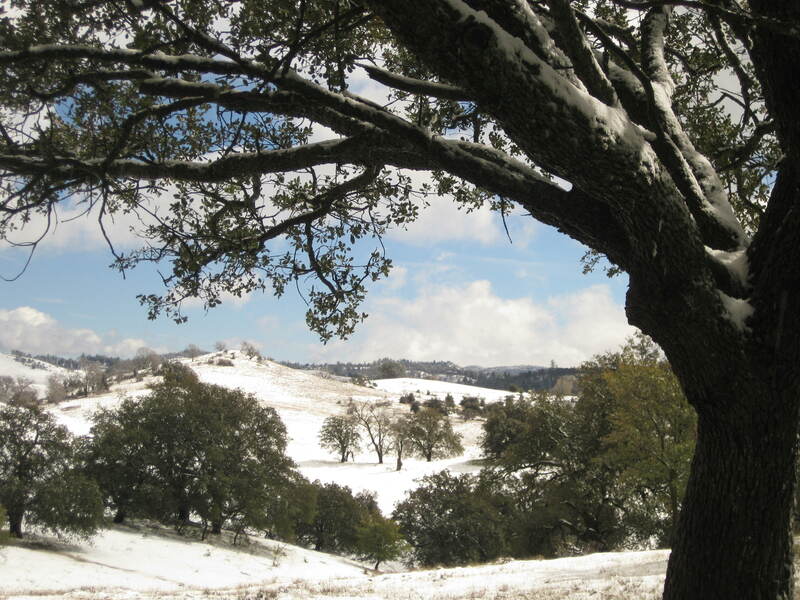 At our usually lunch spot we sat on a snow-covered bench under a huge oak tree. With the wind blowing against our backs, we knew it would be a short break. After refueling, we continued on to warm up. The clouds over the fields provided dramatic chiaroscuro effect and we took lots of pictures. It’s not too often we see snow in this area. We decided to turn around when my GPS read 6.0 miles as my hiking buddy was getting tired. We returned to the trailhead happy to have hiked through snow and mud with views of beautiful hills and valleys and away from the crowds. When we got to the car I checked my GPS and it had calculated 11.3 miles with 2,201 ft. of elevation gain. My legs were a bit sore already as it had been three weeks since we had gone out for a long hike. As always, I highly recommend this place! 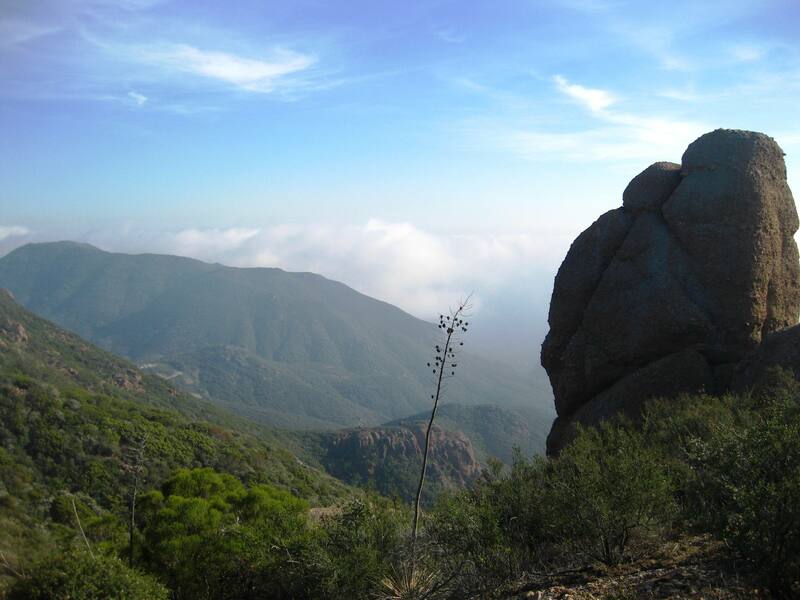 ﻿﻿﻿﻿﻿﻿﻿﻿﻿For a long time I had been telling my mom about Sandstone Peak and the Santa Monica Mountains. She never seemed willing to go there because of the long drive through L.A. Finally, on Saturday morning I said, “We’re going.” We left San Diego at 9am, which was a rather late start, but we weren’t in a rush. Fortunately, the traffic wasn’t too bad as we were able to take the carpool lanes. 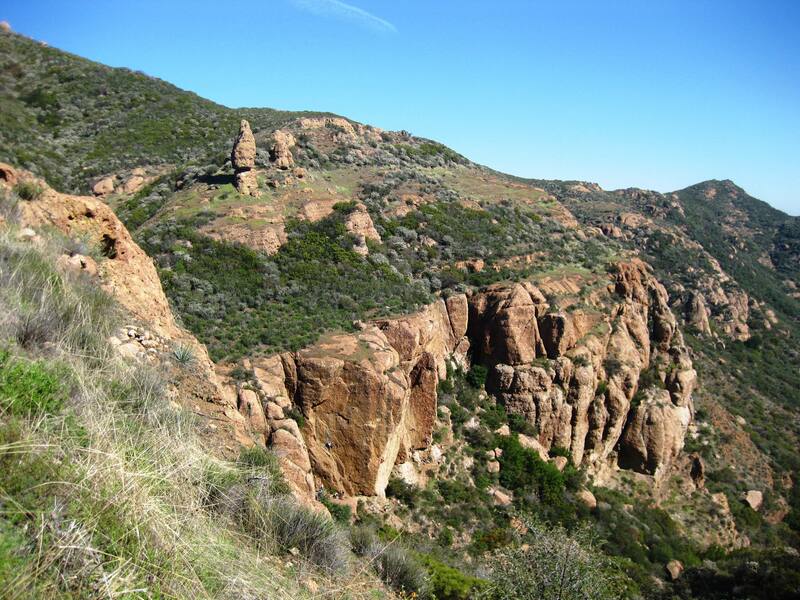 The Santa Monica Mountains are in Ventura County, near the landmark Malibu State Beach. Off the 101 freeway I took the Westlake Boulevard exit and headed west towards the ocean. 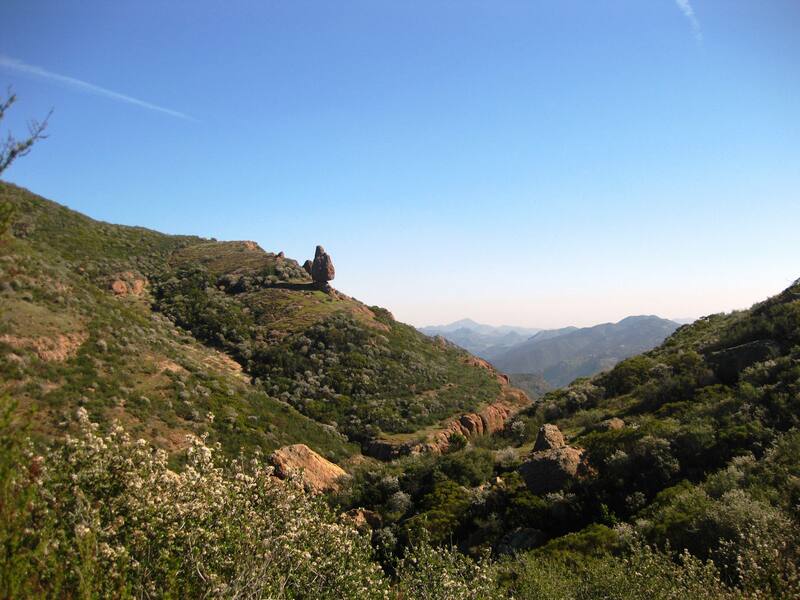 Our destination was the Sandstone Peak trailhead. To get there you have to drive on a very curvy, steep, and narrow road, (watch out for the road cyclists), but it is very beautiful. Just keep your eyes on the road and let the passengers marvel at the scenery. After driving the hairpin turns we arrived at the lot at 11:45am. And yes, it was full, as this is a popular hiking destination. We got are gear together and started around noon. This is a beautiful area with interesting rock formations, canyons, cliffs and views of the valley and ocean. It’s popular with rock climbers as well. From the trailhead we took the Mishe Mokwa Trail. There is plenty of shade along the trail and it’s well-maintained although I did see a lot of trash along the trail which irked me. I don’t think they were conscientious hikers. On the trail you’ll see interesting boulders and rocks, such as Balanced Rock. We tried to access Balanced Rock, but the trail is not maintained by the park. 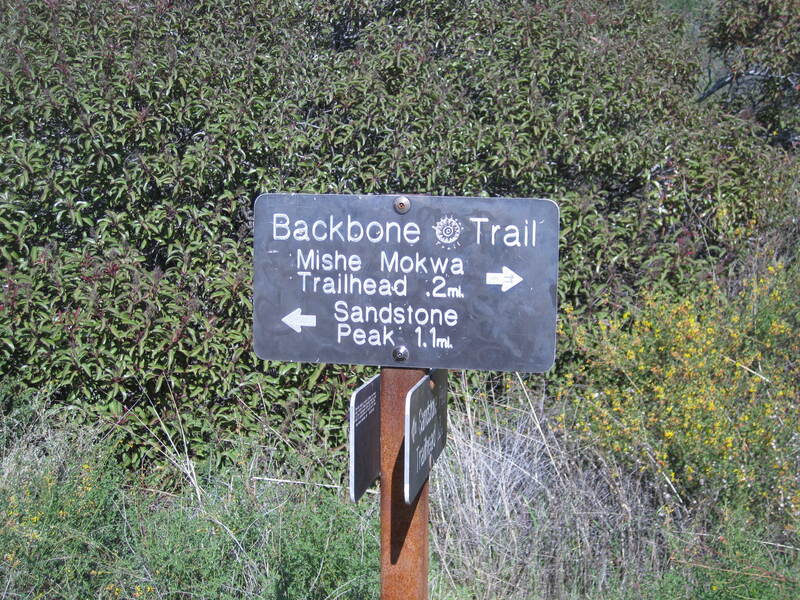 The Mishe Mokwa Trail meets the Backbone Trail, which goes to Point Mugu State Park. 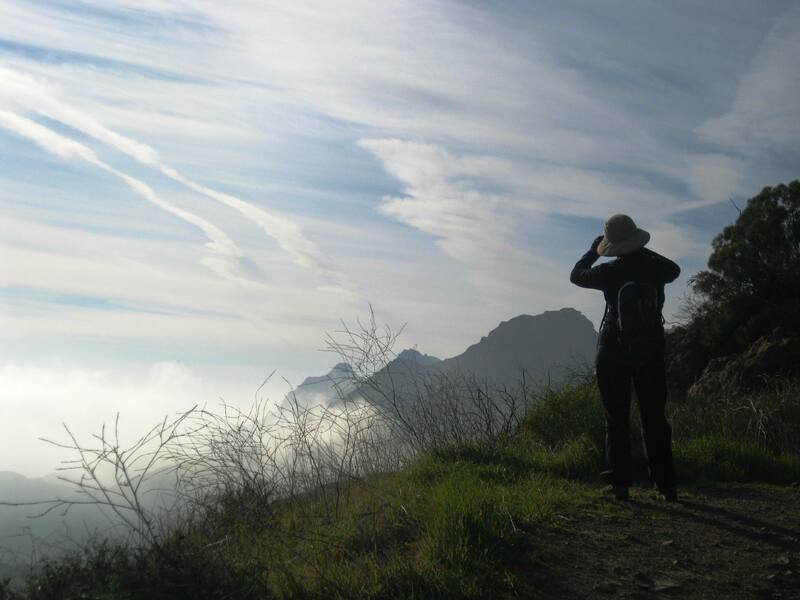 We went in the direction of Sandstone Peak. Once you pass the two water tanks you’ll find yourself on the way to some spots with spectacular views of the Pacific Ocean. It was overcast along the coast so we couldn’t see the islands, but I liked the way the clouds hugged the coast. 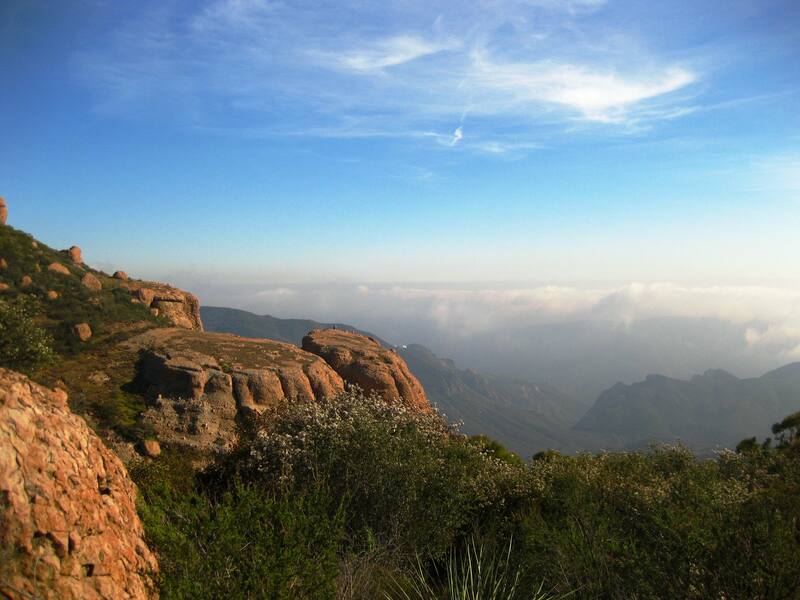 And then you get to the part where you can go up to Sandstone Peak, the highest point in the Santa Monica Mountains. I had already been up there, but my mom didn’t feel like going up there as it was too crowded. So we continued on to the trailhead. From here it’s a descent to the parking lot. Overall, this is a neat place to visit if you’re in the L.A. area.